Situated close to Orly Airport, off the A104 motorway, this Comfort Hôtel offers quiet accommodation 45 minutes from Paris by RER. 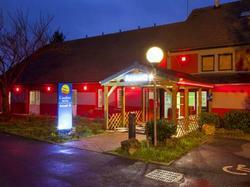 Comfort Hotel Brétigny Sur Orge features an 80-seater restaurant serving traditional French fare with a choice of a buffet or à la carte dishes. The restaurant has a private room for up to 45 people. It is available on request. The Comfort Hotel enjoys a privileged location near the military air base, the birthplace of French aviation, and 5 minutes from the Autodrome of Linas-Montlhéry by car. The reception is open from 07:00 to 22:30 during the week and from 08:00 to 22:30 at weekends. If you plan to arrive outside the opening hours, the hotel has an on-site, automatic, credit card-payment machine, allowing you to pay for your room and access it at your convenience. The restaurant, Le Bistro, is closed at weekends. Breakfast is served from 07:00 to 09:30 during the week and from 08:00 to 10:00 at weekends. The restaurant Le Pit'Stop is open from Monday to Thursday and on Friday lunchtimes. If you plan to arrive outside of opening hours, please contact the hotel in advance in order to obtain an access code. Featuring free Wi-Fi access, this room has a TV with satellite channels and a private bathroom with bathtub.